How does one receive the “call” to enter onto the shamanic path? What causes some people to change their safe, uneventful, and ordinary lives and start on a spiritual search? For many it is a singular instant, a flash when the mystical reveals itself and the person is drawn into the world of shamanic power. For a few, it is a more gradual awakening, filled with numinous events that build upon one another until the calling of the shamanic path can no longer be ignored. In this book of remarkable stories, we learn firsthand about the many different forms of the “aha” moment of shamanic awakening, whether they arise from ceremony, near-death experiences, dream messages, or entheogenic substances. We travel alongside Sandra Ingerman, Hank Wesselman, John Perkins, Alberto Villoldo, Lewis Mehl-Madrona, Tom Cowan, Lynn Andrews, Linda Star Wolf, and other well-known shamanic practitioners as they begin their transformations into the prominent shamans we know them as. We experience the real-life shamanic epiphanies of those with unique shamanic paths--teachers, mothers, social workers, academics, healers, and even rappers who have all experienced a moment in time in which they were awakened and the shamanic path showed itself to them. As each of these unique and beautiful stories of unexpected realization, insight, and inspiration unfolds, we see how these single moments--usually entirely unexpected--are able to transform the individual’s life, clearing their vision and allowing a new consciousness to emerge. As a whole, this collection paints a breathtaking portrait of the intricacies of the shamanic path and the paradigm shift of which we all are part. 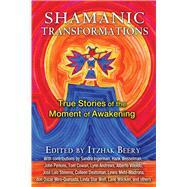 Itzhak Beery is an internationally recognized shamanic healer and teacher. He was initiated into the Circle of 24 Yachaks by his Quechua teacher in Ecuador and by Amazonian Kanamari Pag讠He has also trained intensively with other elders from South and North America. The founder of ShamanPortal.org and cofounder of the New York Shamanic Circle, he is on the faculty of New York Open Center. The author of The Gift of Shamanism, he lives in New York.